A resurgence of small-minded nationalism around the globe, most worryingly in several nuclear-armed countries, has gravely concerned many who champion the international organizations that promote global peace and security, human rights and humanitarianism and sustainable development. Here in the U.S., foreign policy experts across the political spectrum have despaired at Donald Trump’s disregard for multilateral security institutions, withdrawal from the Paris Agreement on climate change, and outright disrespect for global diplomatic norms. 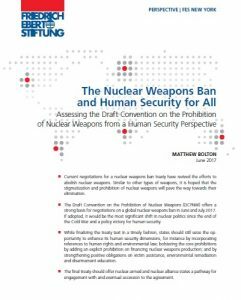 For activists on the streets and officials in the negotiation rooms, the nuclear weapons ban treaty offers a way to reclaim political agency, showing that – even in difficult times – it is possible to address global security challenges through advocacy, diplomacy and multilateralism. By writing a treaty they are choosing to develop new norms, rather than being defined in reaction to the ugly nationalism of our time. They are demonstrating that internationalism is alive and well and can achieve progressive change.